Dallas Mercedes Sprinter Van Rental Services Transportation is one of the most popular vehicles in all limo fleets. Because of the difference sizes and lengths, Sprinter Vans can accommodate up to 14 passengers. They even come in a luxury Sprinter Limo Van that can fit up to 12 passengers. Check out all the available service options for your next event. Check our suggestions for Wedding venues in Dallas Tx, Prom venues in Dalas Tx, Bachelorette Party Venues in Dallas Tx, night out in Dallas Tx, Dine In Dallas Tx. Don't settle for a standard limo, try a Mercedes Sprinter Limo for your next romantic Anniversary evening in Dallas Texas. Mercedes Sprinter Limo are a perfect choice for Bachelor Parties. It's like being in a party bus but the feel of a limo, good leg room and your own personal driver so you can enjoy the fun. The ladies love Mercedes Sprinter Limos for for their Bachelorette Party. Looking for a sedan type transportation but have more people than can fit? Mercedes Sprinter Vans can fit up to 14 passengers for a great price on your next Dallas Brewery Tour. No need to take multiple vehicles. Book a Mercedes Sprinter Van to take all friends and family to your next Concert in Dallas. Get a free Designated driver on us with Mercedes Sprinter Van Rental Services. Black Mercedes Sprinter Vans keeps the somber look needed for Funerals, Wakes and Memorial Services. Luxurious option that fits up to 6 couples with room to enjoy all your friends before and after your next High School Homecoming. Walk around, dance, and take pictures in your Mercedes Sprinter Limo. Ask about our High School Prom specials. Pack your coolers and 12 guests in a Mercedes Sprinter Van for the next Tailgate party. Think of Mercedes Sprinter Vans as your large inexpensive SUV Transportation option for your next tour of downtown Dallas and surrounding counties. 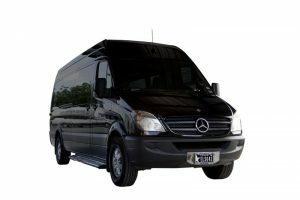 Mercedes Sprinter Vans and Sprinter Limos are both a great option for Dallas Wine Tasting Tours. Needing a Limo or Getaway car for your wedding? Consider a Mercedes Sprinter Limo for the happy couple or shuttling guests and family.